Guadalajara: The US consulate in Mexico's second city, Guadalajara, was attacked with explosives hours before a visit to the country by Vice President Mike Pence and first daughter Ivanka Trump, authorities said Saturday. The explosion late Friday night damaged a wall but caused no injuries, they said. "The investigation has been handed over to federal authorities, who will give information on developments in due time," the prosecutor's office for the western state of Jalisco, where Guadalajara is located, said on Twitter. 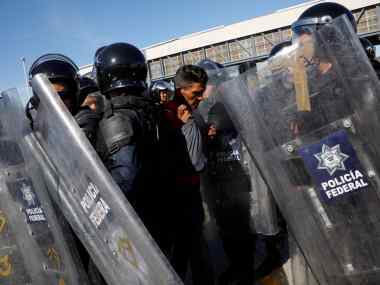 The attack occurred just before Pence and President Donald Trump's daughter and adviser Ivanka flew into Mexico City on Saturday morning at the head of a high-level US delegation attending the inauguration of Mexico's new president, Andres Manuel Lopez Obrador. Prosecution sources said a person threw an explosive device at the building and ran away. The suspect was caught on film by security cameras but evaded authorities, despite the heavy security presence at the building. Grenade fragments were found at the scene, according to investigation sources who spoke on condition of anonymity. The blast left a 40-centimetre hole in an exterior wall. In a video posted online in recent days, purportedly by the Jalisco New Generation Cartel, the powerful drug trafficking organization had threatened to attack the consulate. The cartel, one of the largest and most violent in Mexico, is a top target for US anti-drug operations.